Everybody loves popcorn! Here's how to make popcorn on the stovetop. 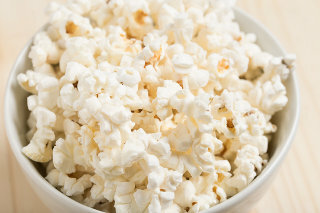 Popcorn is one of the healthy whole grain foods. It has lots of fiber and is fun, too. For the best taste, use the best quality popcorn and oil! Organic popcorn of excellent quality is available inexpensively in the bulk bins in natural food stores. You'll be able to buy any amount you want; scoop from bins and bring home in plastic bags. Choose a saucepan / kettle. Choose large bowl(s) for the freshly popped corn and set out near the stove. Pour a single layer of popcorn into the saucepan and cover the pan. Turn on the burner: higher heat than frying an egg, less heat than for boiling water. If any popcorn burns, use a lower heat the next time. Listen to the popcorn as it pops. As the popping slows, lift the saucepan from heat and get ready to pour immediately into the bowls. If the popcorn pushes up the saucepan's lid, lift from heat while holding the lid, and get ready to pour immediately into the bowls. Try unrefined sea salt, a healthy salt. If desired, melt butter in another small saucepan and drizzle it over the popcorn.